Everyone and their dog was dancing around like they had to pee when they saw the official Smash Bros. site start to count down toward some mysterious end. Was it a trailer? Confirmation of new and old characters? Hardly! 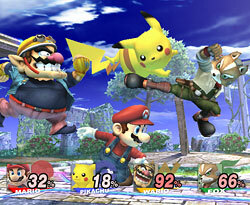 The site has been updated with an official blog by the game’s overseer, Masahiro Sakurai. Personally, this excites me just as much as that other stuff might have! The blog provides a neat insider perspective on the creation of the series, and has already let loose a few new details on what’s probably the most anticipated title on the console (I’m sure we’re all getting a little tired of playing minigame collections by now). Right off the bat, the first post reveals a flurry of composers from Gaming Past contributing to the project; even if you don’t recognize the names, you probably know a lot of the games. But really, we should all know names like Koji Kondo and Kenji Yamamoto. Crazy speculation: does Yoko Shimomura’s presence indicate Kingdom Hearts characters, or Tomoko Sasaki’s the inclusion of the eponymous androgynous NiGHTS star? Please let Motoi Sakuraba herald the appearance of Issac and co. from Golden Sun! *ahem* Sorry, geeked out for a sec. Rest assured, I won’t be making a blog entry every time Sakurai-san does (I’m not some glorified news-aggregator site, after all), I just wanted you all to make sure and bookmark the new blog (with RSS feed! Go Nintendo! ), so we can all get excited every time he posts about how dealing damage makes characters fly farther! How very revelatory!